On Monday she be all growed up! This is her not long after being born. 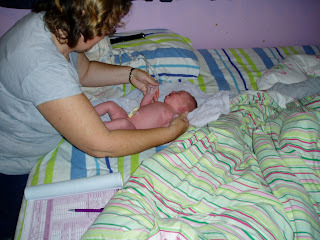 Getting checked over by one of my fabulous midwives (and very good friend). She was born at home in a birthing pool which is why she is nice and clean! This is about six months old. I love the look on her face. 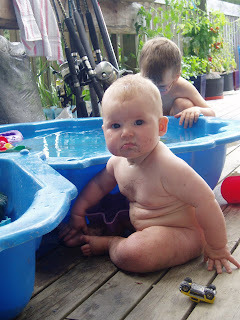 A kind of,"Yeah, so I've got rolls, and your point is.....?" 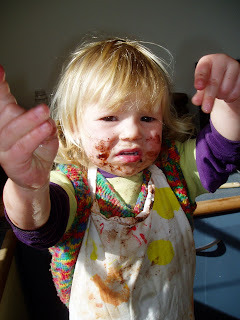 And here is my little raggamuffin now, helping me cook brownies for her birthday afternoon tea this Sunday. And here is one of her birthday pressies. 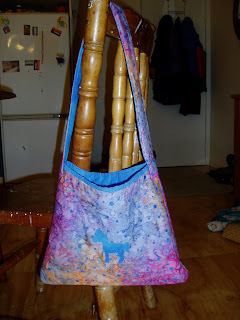 I love this pattern from Jodie at Ric-Rac. This is the second one I've made and it gets easier and easier - by the time I've made my fifth one, I should even be able to remember to sew my lining right sides together (yes, I was having a bad day). That's a little horse applique I put on the front. Hopefully it will satisfy my horse-mad girl. "Horshies, horshies!" she squeals when she spots some. But beware, don't get too close or, "Horshie get me, Mummy!" A pony addiction that needs to be satisfied from afar. I hope this continues long into the future and I'll never be posting a picture of the real 'horshie' she got for her 12th birthday. Ok, so I've been seeing these posts of other peoples fabulous creative spaces. Inspirational, tidy, colourful, organised, user friendly. Jealous? Thought not. This is a warning. 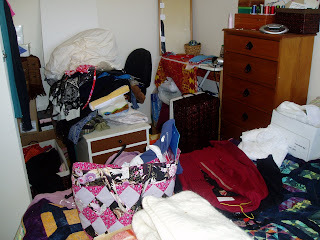 Do not try and combine your bedroom and your creative space. Especially not when you are trying to cram everything from a bigger bedroom with lots of built in shelves into a smaller one with none. Does. not. work. And I don't know how to fix it without spending money, of which I have none. Any ideas? I have a new camera battery charger and so here is a photo of my first step towards my vegetable garden. Impressive, no? 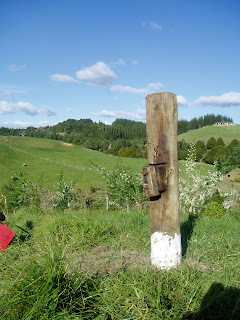 It's a post. It used to be a part of a wharf which is why it has extra bits on it and some white paint. It's big and heavy and I dug the hole for it, carried it to the hole (thank you sackbarrow), lifted it in and rammed the dirt around it. Can you tell I'm a little proud of myself?! The reason we need a new post is because we need to move the dog run (a wire between another post and a sandpit upright that we clip the dog chain onto so she has lots of room to run) because I want my garden to go where the dog run is currently. Finally some progress towards the garden! It feels like we have been here for ever and yet all our work has just been settling in, tidying up and finding places for things. Today was one of the first days that we had together out here and we were very industrious. Dear Hubby plumbed up the shower so now I can shower as well as have a bath (Yay!) and he also finished putting up the smoke alarms. Now he's gone to work on our house that we've moved out of so we can get that rented. Once that's all renovated and rented then he'll be able to spend even more time here on the weekends. It's kinda frustrating. Finally being where we wanted to be and yet still not having enough hours in the day to do all the things we want to get done. That's the story of my life though, and not just related to living here. How do you find time to cook, clean, spend time with the kids, blog (! 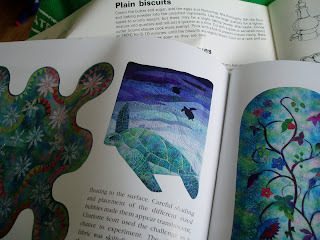 ), quilt, garden, read, catch up with people......? I wish I could be a chicken sometimes. All they seem to worry about is eating, scratching in the dirt and dustbathing. Lucky things. My camera battery charger is poked. No more photos as both batteries are dead ....it will be hard to cope but I'll manage. Especially if I trawl through a few of my older pics! This is a pic of something I'm working on now. It's a little more sewn than that, but not much. 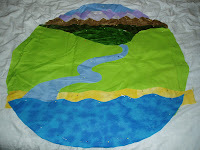 When it's finished it will be a bag/playmat for my son's dinosaurs. Imagine a drawstring cord around the edge, a cave, some lava on the volcano and a couple of appliqued dino's and you get the idea. This one is a quilt I'm working on slowly but surely. I know the images are pretty terrible but they were quick shots so I could remember the layout (digital cameras and quilting....who'd have thought?!). It's all blues with a bit of purple and cream thrown in. I've made a centre block that is foundation pieced with blues and bright orange and I'm a little undecided on whether to use it or not. 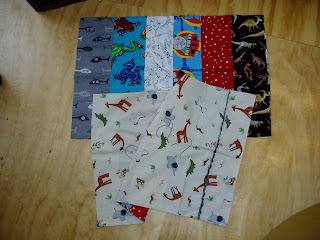 Thrse are a couple of pillowcases I just finished for my nephews. They both have different fabric pieces on one side then a whole piece on the other side with their name freemotioned on it. I've yet to send them off (tomorrow, I promise!) but they're a bit young to read this so I guess I won't be spoiling the surprise. My wee ones spotted these and have both demanded one of their own. My DS has had hours of fun picking his fabrics out of my stash! And this is what I should be working on RIGHT NOW! It's a bag made from an old shirt in a box of thrifted fabrics given to me by my sister-in-law. She is turning 40 today and we are heading down to Hamilton to have a birthday bash with her this weekend and this is her pressie (well, it will be when I pull finger). I made it from this pattern here. 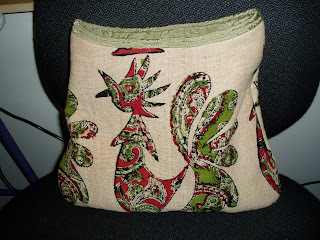 Jodie from Ric-Rac writes a great tutorial and is one very talented and crafty lady. So now you know all my little projects, I feel much more motivated to finish them! Watch this space (and pray they still make battery chargers for my Olympus). 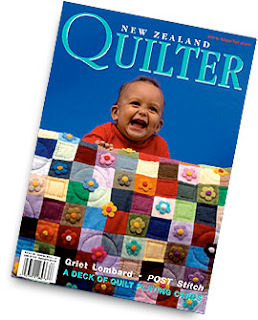 I am a subscriber to New Zealand Quilter Magazine and this month I had received my mag, stuffed it in my handbag and thought no more about it until I got a text from my quilting friend, "Have you seen NZ Quilter yet?" Well, I knew immediately what she was talking about and when I had flicked through it and found the article (all the while holding my breath), I had to do a little dance of excitement! 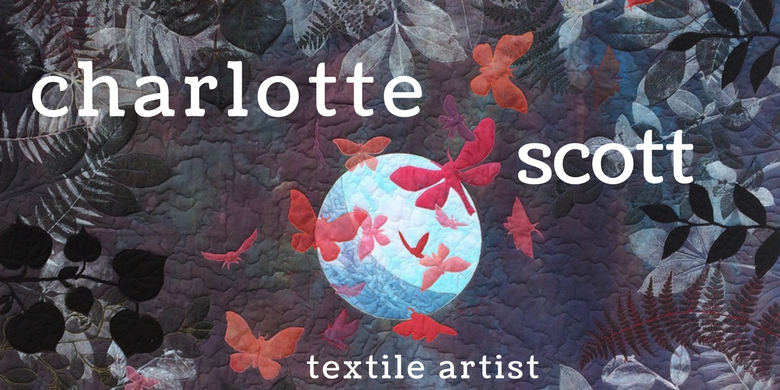 MY quilt - in a MAGAZINE!! Oh my, how exciting!! Sure, I didn't win the competition that we entered, but both of us got picked to travel and I got published. I feel famous! The competition we both entered was the NZ Hoffman Challenge. The challenge involves buying a piece of Hoffman Fabric (everyone gets the same) and make a quilt using a recognisable amount of the fabric. It has to fit within one metre square and can't be a sqare or rectangle shape. It's based around the big American Hoffman Challenge, except we get different fabrics. Anyway, that's my little gloat for today. It's persisting down outside with almost hurricane force winds - so errrmm, no photos of paradise today. These are pictures from our first morning. Neither of us big people had to rush off to work and so we walked around and enjoyed ourselves, 'basking in the serenity'. As yet, our creepy crawly encounters are limited to a nightly visit from a mouse who we see out the corner of our eyes, flitting under our door. Unfortunately he will have to go, I hope he likes peanut butter as that will be his last meal....snap! But I'm expecting many visits from eight legged friends if the amount of webs is anything to go by. My small daughter has suddenly shown herself to be scared of spiders. "Spliler, Mummy, spliler!" She will say with a worried look on her face. I hope to impress her with the beauty of their webs and show her how they can be safely removed outside without hysterics so she doesn't become a complete arachniphobic. 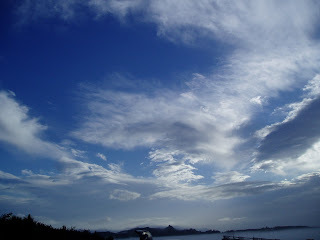 The hugeness of the sky out here amazes me often. I can watch the weather rolling in from the north, usually rain clouds, and then I can see it scudding off into the distance as it passes. I hope I never become accustomed to the view. Well, this morning a lovely man came and turned my phone on. Now I'm back on broadband and have a new phone number to memorise. And they only charged me $500 for the priviledge (*gulp*). Yes, $500 is what it will cost you for a new rural phone connection. But let's not dwell on that. I'm just so happy to be back on-line. We are in our new house. Yay! And I had some beautiful photos to post except I can't find my camera USB cable - it'll still be back at my old place which we are STILL clearing out little by little. I have no idea how people a) organise a complete, all in one day, empty-and-clean house move and b) stay calm and sane and pleasant while they do it! The chickens are all moved and it only took us two goes to catch them all. 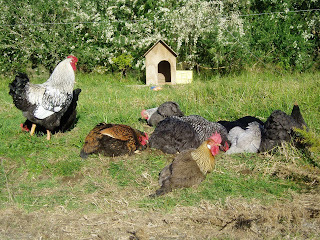 Ten hens and one rooster who have now been in their enclosure for six nights. Only two eggs today, which is an improvement on one for the last few days. I think I might have to have a loud conversation about heads and axes outside their cage! The puppy has been getting more daily excercise than she ever has before as she bounds along enthusiastically after the kids. And the kids. Well, their first night they were very excited and we were prepared for a wakeful one but, to our surprise, they slept like they always do and every night since has been a settled one. It must be all the fresh air. Hubby and I are tired and busy but very happy to finally be here. My first morning at about quarter to 7, I went for a stroll to the longdrop outside. Such stillness and peace. 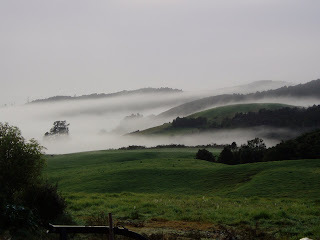 It was chilly and misty, the totara trees just shadows looming in the distance. I could hear the stream at the bottom of our property and a rooster far off in the distance. 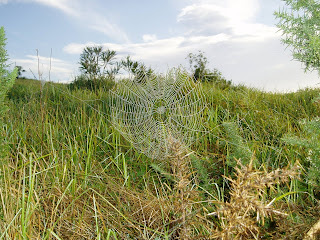 The cobwebs in the grass were outlined in dew and it was such a fantastic feeling to be here. 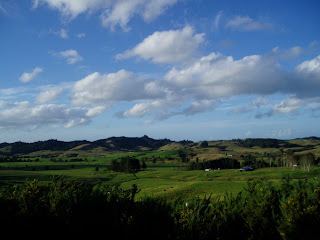 I was filled with greatfulness to have the chance to live in a place like New Zealand and, even better, a place like right here.